The nation is worried that Sabarimala may become the next Ayodhya. Kerala chief minister Pinarayi Vijayan has assured people that he won’t allow that to happen. But judging by the events that have unfolded since September, I am not convinced. I covered a similar protest in Maharashtra’s Ahmednagar district, at Shani Shingnapur village. There was tension there for about 40 days in 2016, but the responses of everyone involved were far removed from what is playing out in Kerala in the name of faith and tradition. The 400-year-old Shani temple has a sanctum sanctorum comprising a 5.5-feet-high black rock installed on an open-air platform. Women were not allowed in, but through dialogue, they gained entry into the sanctum sanctorum in 2016 without any violence. If we have to give credit for how that situation turned out, it should go to the trustees for trying hard to exchange ideas with all stakeholders involved, including their then challenger social activist Trupti Desai. Women from the village were also open-minded enough to allow other women devotees to enter the sanctum sanctorum, even if they did not believe they should go in themselves. 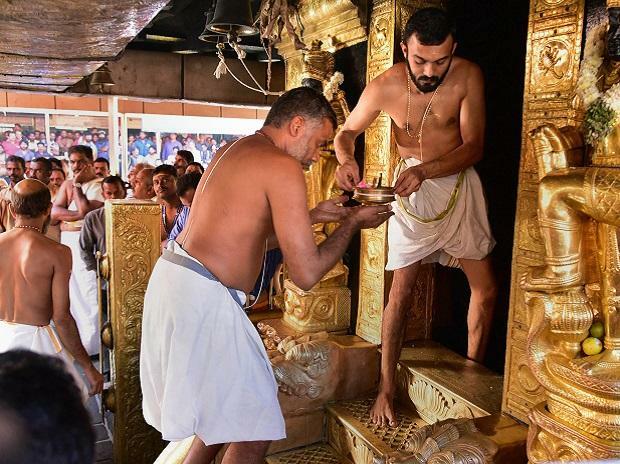 In Sabarimala, social rifts are challenging faith and constitutional rights, and thus not allowing implementation of the Supreme Court order. In the Shani Shingnapur case, however, a Bombay high court order ensured that the principle of equality was respected. While the Shani Shingnapur protests were on, feminist leader Vidya Bal and advocate Nileema Vartak filed a public interest litigation in the Bombay high court. The PIL sought the court’s intervention to ensure the implementation of The Maharashtra Hindu places of Public Worship (Entry Authorization) Act, 1956. This law was meant to abolish untouchability from the every spectrum of society, and prohibits discrimination of any kind at Hindu temples. During the hearing, the state assured the court that the law would be implemented and so the PIL was disposed off. But religious harmony was not achieved only by law enforcement officials in this village. A dialogue with the locals by Varkari tradition leaders Badrinath Maharaj Tanpure (Gadgebaba Maharaj panth) and Bhaskargiri Maharaj had a significant impact. The Varkari tradition has been a part of Hinduism in Maharashtra since the 13th century. The community follows spiritual beliefs and practices based on peace, harmony and non-violence, and its literature is known for its gender-sensitive, progressive outlook. The Kerala government could have opened a dialogue with Sabarimala protesters in a similar way. In Shani Shingnapur, villagers had their own reasons to argue that women should not enter the temple – they believe that as a brahmachari, Shani doesn’t welcome women devotees. For 40 years, women had not been allowed to enter the sanctum sanctorum, though some elders shared memories of earlier years when this wasn’t a strict tradition. There is no information available on when exactly it became the rule not to allow women in, but till April 8, 2016 women were banned from entering the sanctum sanctorum. Even now, local women believe that God will not curse them as long as they do not touch the God themselves. But they have accepted the importance of law and the high court order, and so are allowing others into the sanctum sanctorum. On November 28, 2015, a young female devotee entered the Shani deity’s platform. Nobody stopped her or asked her to step down, and she was captured on a CCTV camera. Later in the day, though, this footage wreaked havoc. The temple management trust decided to do ‘purify’ the entire temple the next day. The trust shared the footage of the purification process with the media and claimed that the temple was ‘sanctified’ again. Seven security guards who failed to “protect” god Shani from female devotees were suspended with immediate effect. To date, the identity of the woman devotee is not known, and so no one knows whether she entered the sanctum sanctorum intentionally. Some have argued that she may have had a mental disability, but there is no proof of this either. Meanwhile, Trupti Desai, founder of the Bhumata Brigade and then a little-known social activist, was watching this news on television. As a ‘Hindu believer’, she decided to claim her religious right to enter Shani Shingnapur. On December 20, 2015, Trupti along with other women tried to enter the sanctum sanctorum, but they were stopped and villagers protested. Desai was taken to the local police station. She then gave the temple trustees and Maharashtra chief minister Devendra Fadnavis an eight-day ultimatum to create an atmosphere in which she could enter the sanctum sanctorum. Later, she announced a protest from Pune to Shani Shingnapur temple with other female devotees on January 26, 2016. At Supa village, before her destination, Desai was taken into police custody. Temple trustees recognised that a crisis may be brewing because of their decision not to allow women in. Consequently, they banned male devotees too from entering the sanctum sanctorum. Only two male devotees (paying close to Rs 11,000) and male priests were allowed to perform the abhishek on Shani. This formula came from none other than self-proclaimed spiritual guru Sri Sri Ravi Shankar. As meetings between temple trustees and the government did not bear fruit, they mutually decided to reach out to Sri Sri for his ‘art of negotiation’. Temple trustees camped in his Bangalore ashram for days and he held meetings in Maharashtra. We have to understand why Sri Sri could interfere in this matter. Before the Maharashtra government took over the Shani Shingnapur and other temple trusts in 2018, the trust was controlled by Nationalist Congress Party members. The party’s top leaders said that the issue must be resolved, but beyond that made no attempts to get things under control. Fadnavis was making statements in support of female devotees and addressing Desai’s demands, but beyond that lip service he did nothing. The authorities did not try to implement the 1956 Act. The trustees and the government both decided that Sri Sri Ravi Shankar was the answer. Sri Sri came up with two formulas. The first was the Tirupati-Balaji temple formula, where the sanctum sanctorum is out of bounds for both men and women. Second was the Kashi Vishwanath temple, one of the holiest Hindu shrines, where both men and women are allowed into the sanctum sanctorum. The high court order of April 1, 2016 had no impact in the first week. Then came the festival of Gudi Padwa, during which villagers traditionally conducted a water abhishek of the deity. When the same people who were blocking Desai and her followers were not allowed into the sanctum sanctorum either, they felt insulted. On April 8, 2016, they stepped onto the Shani platform for the abhishek. The moment this news was in the public domain, Desai and her followers reached Ahmednagar and performed the puja too. Women were not stopped this time. Meanwhile, from the day Desai started her protest, Varkari leaders from the region visited the village and started a dialogue. They were even part of the meetings with Sri Sri. When the court order came and male devotees decided to perform the jalabhishek, these Varkari leaders convinced villagers that it was time to respect women and the law. Had that conversation not happened in the village, the opposition could have become violent or continued till today, like in Sabarimala. Desai later took up similar protests at the Nashik Triambakeshwar temple and Kolhapur Mahalaxmi temple. Recently, she tried to visit the Sabarimala temple too and returned after an unsuccessful attempt. Revisiting the Shani Shingnapur protest shows that dialogue with all stakeholders right from the beginning could have changed the outcome at Sabarimala. Alka Dhupkar is the Editor of Symple Times, a newspaper to be launched soon by the Sakal Media Group.